Even though some automakers like Ford are giving up on sedans, Subaru’s WRX/STI performance cars are still important to the lineup, according to Dominick Infante, Subaru’s national manager of product communications. Infante told Motor Trend, they will still offer sedans like the Impreza and WRX/STI because they are a good hedge as gas prices go up. “Gas prices are starting to come up now. So a good hedge for better economy is having a sedan.” says Infante. Subaru won’t forget about their customers in their late 20s and early 30s who are a big part of their business. Products like the Impreza, WRX/STI and the BRZ sports coupe still have an important place in the lineup. But Subaru of America has a new love. Subaru was lacking a 3-row vehicle for some time, and their loyal customers moved to other brands when they’re in the middle stage of life parenting young kids. As their families grew, Outback and Forester owners moved to other brands like the Ford Explorer, Toyota Highlander, and Honda Pilot. Now Subaru has the all-new 7-8 passenger Ascent 3-Row family hauler. Subaru of America (SOA) asked parent company Subaru Corp for a new 3-Row SUV and the Japanese automaker listened. It’s built in Lafayette, Indiana just for North Americans, and it won’t be sold anywhere else in the world. SOA got input from their dealers and found out what their customers were wanting in a large SUV. It looks like Subaru came up with the right vehicle for America families. 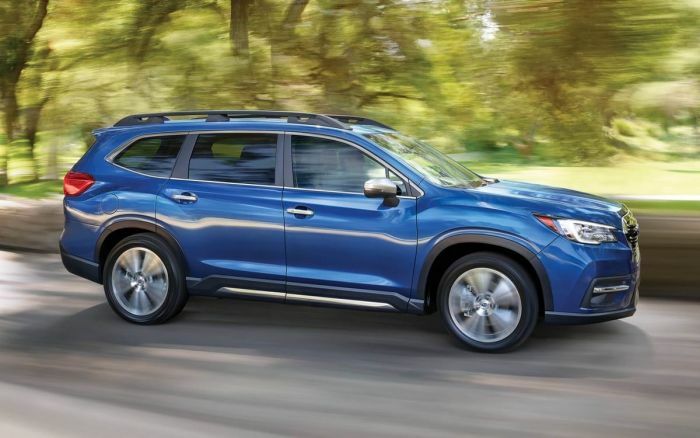 The all-new 2019 Subaru Ascent is now the brand’s new love. I'm sure the Ascent will sell well. Perhaps next year they will incorporate the Driverfocus technology. I'd also like to see the thigh support extension on the passenger's side - minor tweaks. I'm not sure why the eight passenger seat configuration isn't available in the Touring model.